I'm 2-0 on game threads this year and the Pilots need some good luck, so here it is. Big game for UP, lose this one and the Pilots are staring a six-game losing streak right in the face. I haven't even heard of 90% of USF's roster and it's all freshmen and sophomores with the exception of Boyce and Foster, but it's hard to argue against their results this year under their new coach! Barreno was pretty good against LMU, I'll guess he's in the starting lineup on Thursday and Chier comes off the bench. Off the bench - PF Chier Maker (FR, 6-7 200), SG Rashad Jackson (SO, 6-3 180), C Joseph Smoyer (FR, 6-10 210). Off the bench - PF Remu Raitanen (FR, 6-9 198), SG/SF Chase Foster (JR, 6-5 187), PG/SG Ronnie Boyce (SR, 6-3 158), PG Frankie Ferrari (SO, 5-11 179), C Jimbo Lull (FR, 7-0 252). 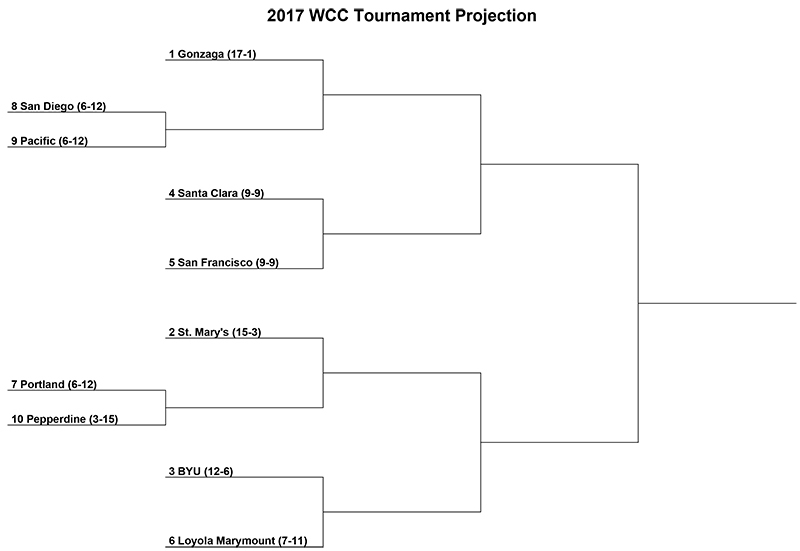 And squarely in the "I'm married with two kids and have nothing better to do" category...here's a projected bracket for the WCC tournament. I think an interesting lineup would be Wintering, Jackson, Maker, Taylor, and Hartwich. D'Marques has been struggling lately, while Rashad has been a spark off the bench. No Jazz in the lineup when he and Alec are being toasted as one of the best backcourt duos in the country? Pish! This could be a very good game against an over achieving USF squad coached by the man who many hoped would be the next coach at UP after he left Columbia and before Terry Porter took over. But Kyle Smith apparently never really considered the UP coaching position, once calling it, "the worst head coaching position in the WCC." There'll be another turnout of UP fans in War Memorial, but sadly not near the number that witnessed the debacle at SCU....hopefully we'll see a better performance, if not a win. Latest line from Las Vegas is USF by 10....and KenPom gives the Pilots less than a 20% chance of winning (hey, it's better than the 1% chance he gives the Pilots of beating GU on Saturday). Word is Phil is feeling good enough to travel, but don't know if he'll play, and I haven't heard anything about Jarrel since Monday when his status was "day-to-day." pilotfan4life wrote: I think an interesting lineup would be Wintering, Jackson, Maker, Taylor, and Hartwich. D'Marques has been struggling lately, while Rashad has been a spark off the bench. Agree that D'Marques has not played up to his or our standard on either side of the ball of late, and Rashad does deserve increased court time (probably off the bench), but if he's is going to start it will have to be part of the "small" lineup that does not include Hartwich, but does include Jazz. The issue of scoring droughts has returned in spades. 4+ minutes between the 1st and 2nd media timeouts, and another 4+ minutes as USF scores 12 straight and counting. Sigh. Man, they just can't afford these dry spells. This one's up to five minutes already. And Tyson can't buy a bucket. Missed two 3's and has yet to hit one in 2017. Dean Murdoch wrote: And Tyson can't buy a bucket. Missed two 3's and has yet to hit one in 2017. Huh, and his next shot goes in. I may have to spew out some negativity towards these guys more often if it's going to get them going! Pilots are probably lucky to be within 11 at the half. Outrebounded 21-11, can't hit a free throw, only six three-point attempts...and only four points off 11 USF turnovers. 10 guys with at least five minutes played for USF. Six for the Pilots. Two verrrry different substitution patterns at work in this game. Start the 2nd half with a turnover and a breakaway dunk the other way. This is going to be difficult. What's the over/under on the longest scoring drought in Spokane Saturday? Final, USF romps 75-50. Is it too late to just not play the canceled GU game? up7587 wrote: What's the over/under on the longest scoring drought in Spokane Saturday? Oregon State went the first 9:16 scoreless against Oregon... 21-0 to start the game...Oregon was ranked 13. Gonzaga is ranked 5 and we barely beat Oregon State. And it seems like we were playing better basketball then. Or perhaps there just wasn't enough game tape in opponents hands yet of Terry Porter as the coach with these players. It could get ugly...again. All right then, next game on Thursday against Pepperdine? Is it the problem that we go on low confidence scoring droughts or that people have figured out our whole two guards who do all the scoring thing? Sorry, I wasn't able to watch and am just curious. Count yourself lucky not to have seen it - it gets just painful to watch after awhile. I feel sorry for the players, the coaches, and the fans. As to the offense, both your observations seem correct. We also just had an amazing number of shots that did acrobatics around the rim before falling out. And, it seems our offense is slow. At the beginning of the year, we were delighted to see the fast pace, lots of player movement , quick passes - just fun to watch - and it seemed effective. Now, we set up, dribble, make a pass, look around, play the clock down, call for a screen, wait for the screen, dribble into the key, and hope for a shot or outlet - all sort of predictable - and not that many open shots. bullwinkle wrote: And, it seems our offense is slow. At the beginning of the year, we were delighted to see the fast pace, lots of player movement , quick passes - just fun to watch - and it seemed effective. Now, we set up, dribble, make a pass, look around, play the clock down, call for a screen, wait for the screen, dribble into the key, and hope for a shot or outlet - all sort of predictable - and not that many open shots. To your point - after the USD win, the Pilots were 91st in the nation in adjusted tempo by Kenpom's site (so just outside of the top 25% of teams). When you don't have enough players, the ones you have run out of gas and slow down. I feel for Alec. He started the season as an all-conference player. Hard to support that now. Dean Murdoch wrote: To your point - after the USD win, the Pilots were 91st in the nation in adjusted tempo by Kenpom's site (so just outside of the top 25% of teams). up7587 wrote: When you don't have enough players, the ones you have run out of gas and slow down. I feel for Alec. He started the season as an all-conference player. Hard to support that now. Is now a good point to say, "I told you so!"? From the beginning of the season it was apparent the Pilots' short bench was causing the staff to leave at least three of the players (Alec, Jazz, and Gabe) on the court for way too many minutes, and that eventually their young bodies were going to wear down if they did not get more rest. Last night it was apparent the wear and tear from too many minutes has finally caught up with the team. I didn't keep track, but it seemed USF was always substituting fresh players while the Pilots struggled to keep up, and it will only get worse as we head toward tournament time unless the "regulars" get more rest. Watching Alec over the last four games it is apparent he is tired and hurting, and as I've said before, if a young player is tired and hurting he risks injury....and it would seem to me Alec, and others, have reached that point and need to sit awhile or risk further injury. The season is not lost if the Pilots can go to Las Vegas rested, regardless of their record, but will they be allowed to rest before the number of injuries gets larger? These young men are not professional athletes, they are college kids. It is unfortunate that Coach has played (or has been forced to play) those three as many minutes in the first half of the season. Its tough to maintain with two games a week, travel, school, and practice this time of year. Its a grind at the least and even the most conditioned break down. Lets hope they can get back on track soon, they are a fun team to watch when firing on all cylinders.